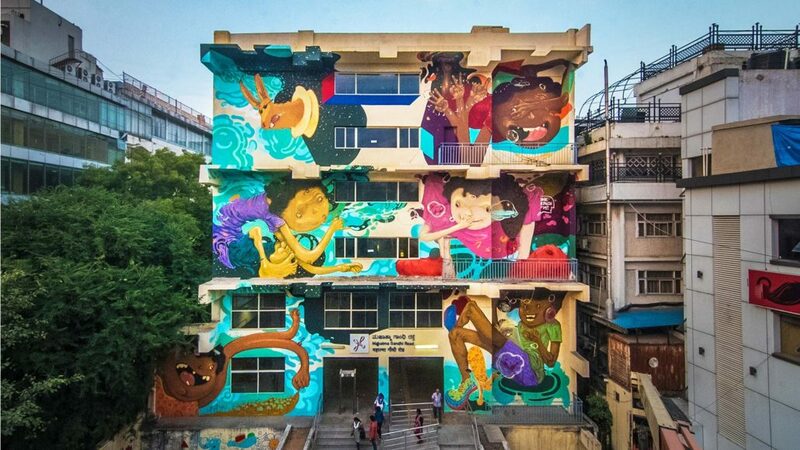 A call for setting up of institute of fine arts in Meghalaya was made here on Thursday even as local artists got inspired by a street art festival which is underway in the city under the direction of renowned artist from Mumbai, Ranjit Dahiya and his colleague, Sanjib Roy from Assam. Dahiya is part of the Bollywood Art Project (BAP) who had also painted Bollywood actor, Amitabh Bachchan on his 75thbirth anniversary in Mumbai that turned out to be India’s tallest mural (230 feet height, and 30 feet width). The festival known as “Shillong Street Art Fest-2018,” is being participated by Dahiya who arrived here last week, along with some local artists who wanted to showcase their talents and readied to learn more techniques from the two seasoned artists in their bid to take up fine arts as a profession. Dahiya who involved in street art in various cities of the country, is guiding the local youth techniques of painting in the city. An ongoing task now is to complete the portrait of veteran Bollywood actor, Mithun Chakraborty at a government building here. “Mithun is a superstar and very popular actor among the people here,” Dahiya said. Talking about talents in art, Dahiya urged the youth to showcase their talent in fine art, and called upon the state government to set up fine arts institute to help the youth become professional artists and provide proper training to the youth. Local artist, Oliver Wendell Lyndem of the “Can’t Stop Art and Craft,” a group formed by him and other artist friends, said that he along with his friends have learnt a lot from Dahiya especially styles and various techniques of painting. “We learnt different techniques from these seasoned artists including how to use shoe polish brush in painting,” Lyndem said. According to Lyndem, as many as 15 local youths have benefited from the street art festival and managed to learn painting skills by assisting the artists.